This one came across my desk a little on the late side, but you know what they say, better late than never! This past January Hyvmine released their debut album, Earthquake, and it is staggeringly good on so many levels. The brain child of Berkeley schooled, Al Joseph, Earthquake takes technical progressive mastery, which is typically something that appeals to a niche market, and molds it into melodic and singable tunes. The outcome is a nine track album with nary a dull moment that I can imagine appealing to not only progressive fans, but the whole fandom of heavy music. Al Joseph made a name for himself by demonstrating his impressive guitar skills through a couple of solo albums, and a few installments of Guitar Hero. One such album, All of Creation, was the source for four of the nine tunes which were instrumentals in their original form. Having heard the Hyvmine versions first, which contain vocals performed by Joseph, it was an interesting experience to hear them without the vocals. The contrast really demonstrated the glaring difference in ‘accessibility’ that having vocals can really create. The songs in instrumental form allow the listener to focus more on the instrumentation and impressive level of talent involved in both the writing and performing. Add Joseph’s powerful vocals on top and ding the bell, dinner’s ready. Kicking things off is “Shift,” one of the four I mentioned above that were originally released instrumentally. It begins in classic prog form with an open and melodically beautiful moment. Once the verse starts it felt almost as if I was back in the 90’s. I was not expecting the low end raspy vocals on top of the picking guitars. It reminded me of the trail of bands spawned from the likes of Pearl Jam. Despite my surprise, I am a fan of that era and enjoyed the singable nature of this album opener. Then with just over a minute left it was as if the prog meter was thrust into overdrive, my ears tweaked and from that moment I was incredibly eager to hear the rest of the album. The single, “Shogun” is yet another of the instrumental four and the first to have a music video. The tune jumps right into a bit of a djent-ish feel that just makes you want to bang your head in unison. I am thoroughly impressed at how effective Joseph’s vocal lines are in making these songs feel completely new. He was very successful in writing flawless vocal accompaniments. “Cliffhanger” is the aptly titled album closer. A strong chuggy riff carries this tune through the verses to the anthemic chorus carrying a sad and angry message of a defective relationship with a what sounds like a judgmental absent parent. Despite the actual meaning of this song, “Cliffhanger” to me means I’m on hook til the next installment of Hyvmine. Being a musician myself, I am attracted to demonstrations of talent in combination with effective songwriting. What I mean by that is that one can be an impressive player with great skill and not be so great at writing a good song. Being a music lover, I want music to grab me both intellectually and emotionally. Earthquake is the prefect blend of amazing musicianship and effective songwriting. 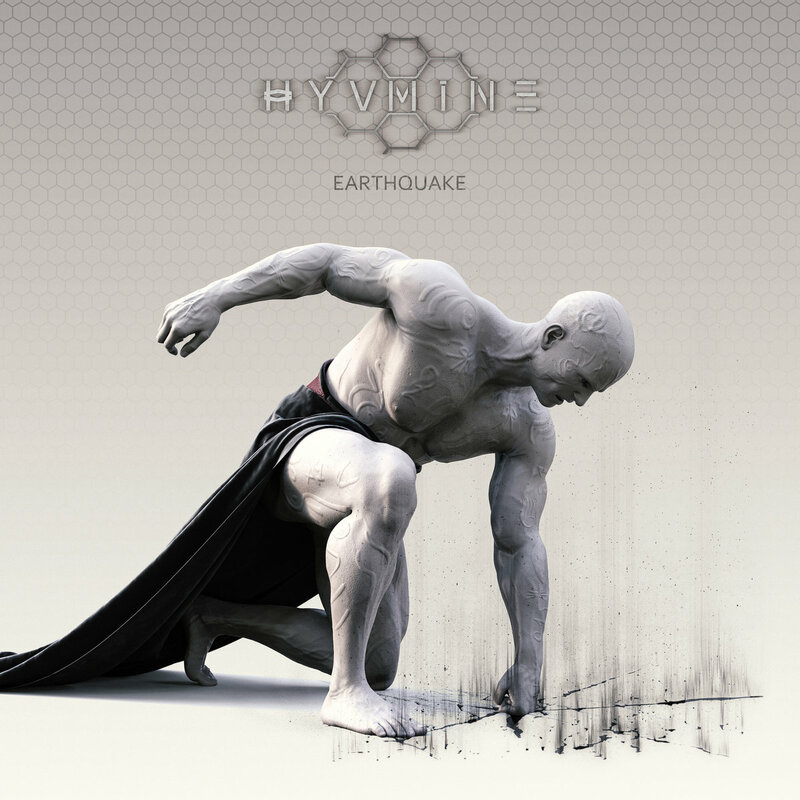 From the tight riffage, to the sick guitar leads, to the strong and emotive vocal performance, Hyvmine’s Earthquake is going to be in my playlist for a long time to come. Dwayne has been writing album reviews since the mid '90's and enjoys a wide range of sonic pleasures, most notably music with progressive elements. He can also be found on Metal Nation Radio the second Sunday of each month, 10 am til 2 pm ET for Metal Rises in the East where you can hear an array of hard rock and metal mostly comprised of unsigned and independant bands from around the world. EDGE OF PARADISE Announce New Album and Music Video Shoot in Iceland!